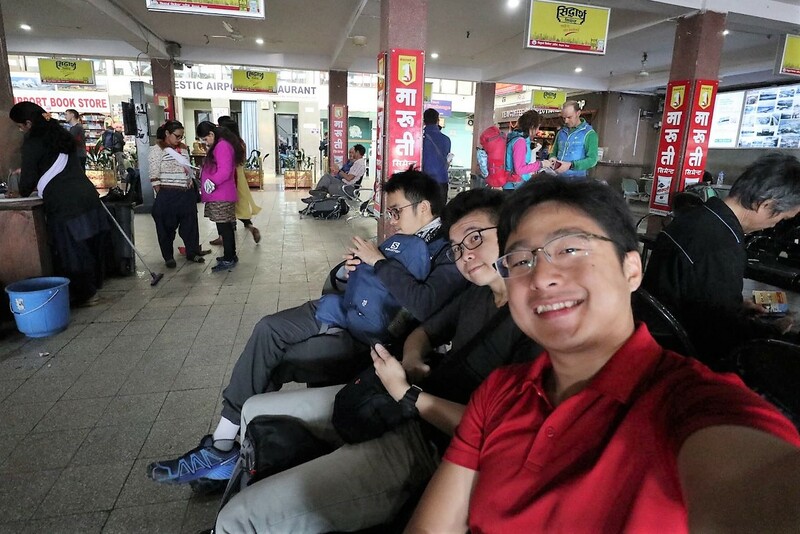 09.30am - We took off for Lukla on a small plane having a 17 seating capacity excluding the crew. 10.10am – Arrived at Tenzing Hillary Airport, Lukla and adjourned to The Nest Hotel for tea while the guide sort and divide the load baggage to be carried by porters. 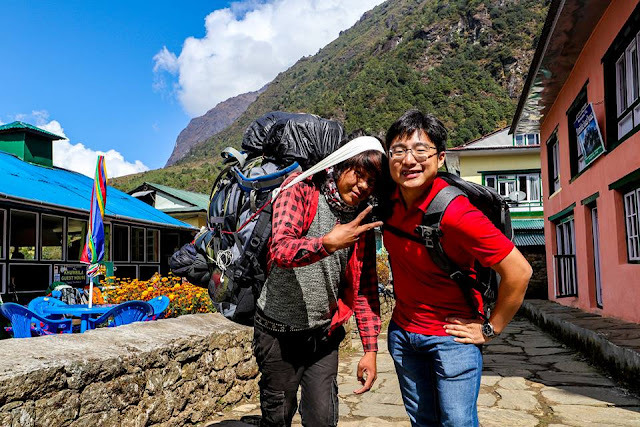 11.05am – Start of our trek towards Phakding. 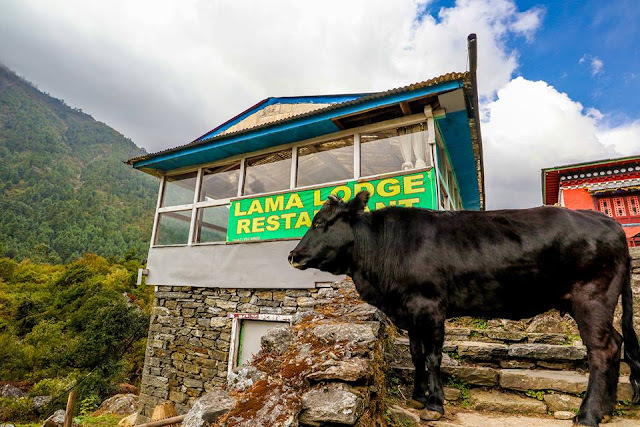 At the Lukla village entrance, we were unhappy that we had to pay Nr2,000 each which we felt it should be covered by the agent as it was not mentioned in the agreement. 01.10pm – Arrived at Everest Summiter Lodge & Restaurant for lunch. Our standard Dal Bhat and our own preference of drinks. 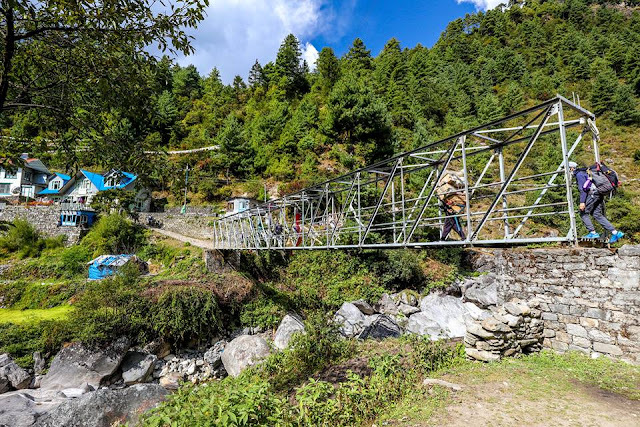 02.23pm – Continued trekking towards Phakding. 03.28pm – Arrived at Hotel Beer Garden for the night. It was raining the whole afternoon. We had our dinner at 5.55pm. Briefing was held at 6.30pm. We slept at 7.30pm. Temperature was 8 degrees Celsius. 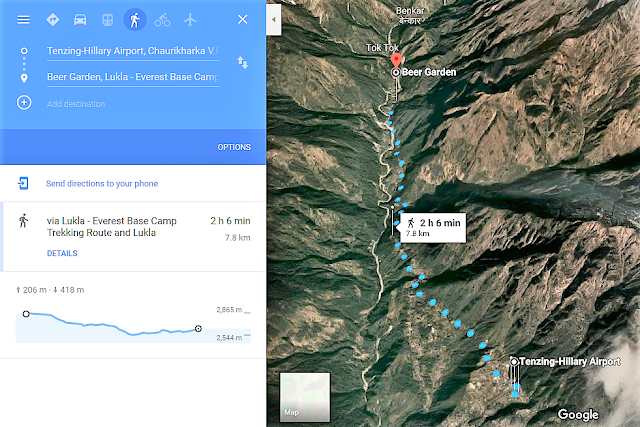 EBC trek start with the 30 min/136km scenic flight from Kathmandu to the tiny airstrip at Lukla. We had time to stroll around while the guide sort and divide the load baggage to be carried by porters. We then took an easy 3hr walk to Phakding village for the overnight stop, trekking through Cheplung (2,700m), Thado Koshi and Ghat (2,590m) villages. And the rest of the time in Phakding we looked around the village for local cultural experience. 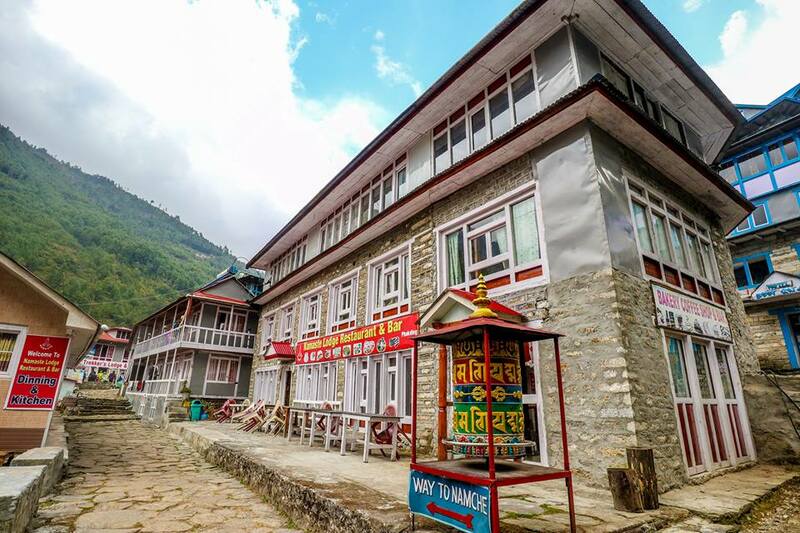 Phakding is a small charming place with some comfortable lodges. Alan Koh and Ong Teik Hong taking hotel breakfast at 6am. We had our hotel breakfast at 6am. 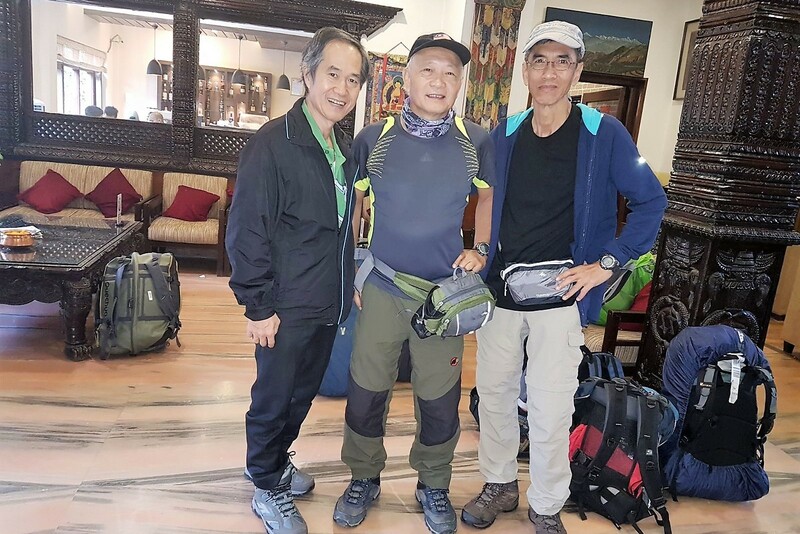 (L-R) The 'A' Team: Ong Teik Hong, Ching Neng Bin and Alan Koh at the hotel lounge. The group (L-R): Our guide Prakash Kapri, Simon Loh, Randy Ngatimin, Abdul Rashid, Ong Teik Hong, Alan Koh, Ching Neng Bin and our trek operator Shankar Pandey at hotel lounge waiting for our van to take us to airport. 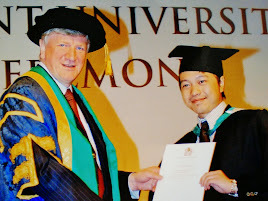 L-R: Simon Loh, Randy Ngatimin, Ong Teik Hong and Alan Koh. We left for the domestic airport at 7.30 am and that place was a pandemonium broke loose which passengers and porters rushed to enter. (L-R) The 'B' Team: Abdul Rashid, Simon Loh and Randy Ngatimin. Our Summit Air boarding pass. Summit Air is an airline based in Kathmandu, Nepal. Goma Air was re-branded to Summit Air on 13 March 2017. The airline operates from short takeoff and landing airstrips of Nepal. We took off for Lukla at 9.30 am using a small plane having a 17 seating capacity excluding the crew. Flying over the Khumbu Valley country side villages as viewed from the plane. We were flying through the alleys of Mountain tops. The propeller plane flies really close to the valley mountains. 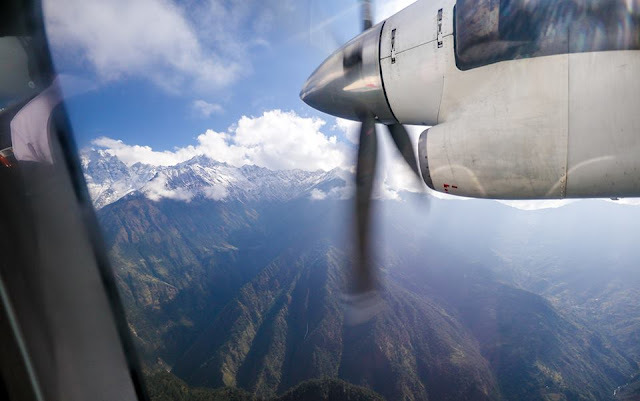 View of the Himalayan mountain range from the propeller plane from Kathmandu to Lukla is awesome. Remember to sit on the left side of the plane to get a great view of the Himalayan mountain range. The airport was renamed in honor of Sherpa Tenzing Norgay and Sir Edmund Hillary, the first two people to reach the summit of Mount Everest and also to mark their efforts in the construction of this airport. The airport's elevation is 2845m. The flight was dramatic on approach to lading in Lukla. It was the most dangerous airport in the world. 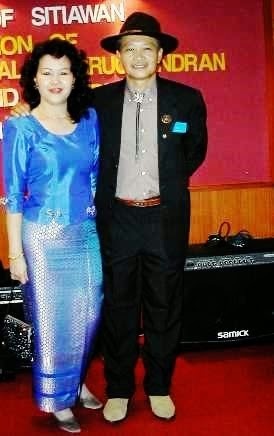 Last year, a cargo plane crashed, killing the both pilots. As our plane landed, the porters quickly came to unload the baggage. Making our way to the rest point for briefing before starting our Everest Base Camp trekking adventure. 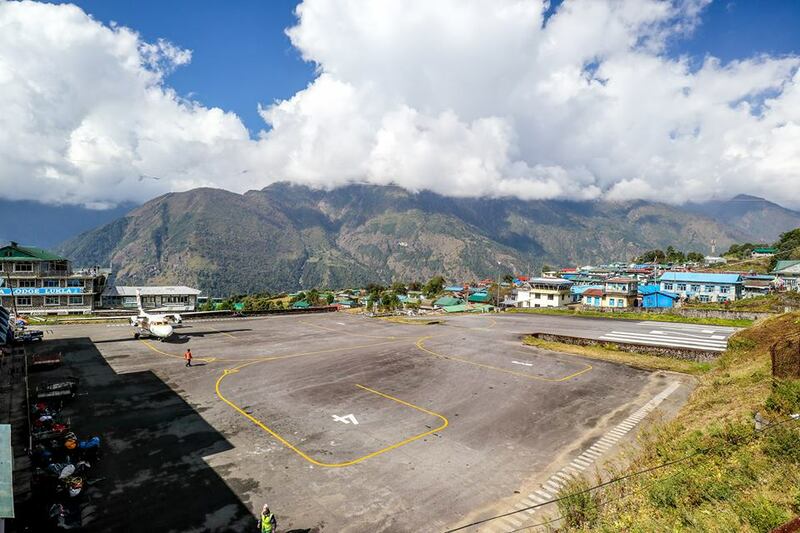 On May 27th 2017, Summit Air Flight 409 was performing a freight flight on a Let L-410 from Kathmandu to Lukla with three crew, was on final approach to Lukla's runway 06 at about 14:04L (08:19Z) with poor visibility when the aircraft contacted a tree short of the runway and subsequently contacted ground about 3 meters below the runway level. The aircraft slid down the slope before coming to a rest about 200 meters below the runway level. 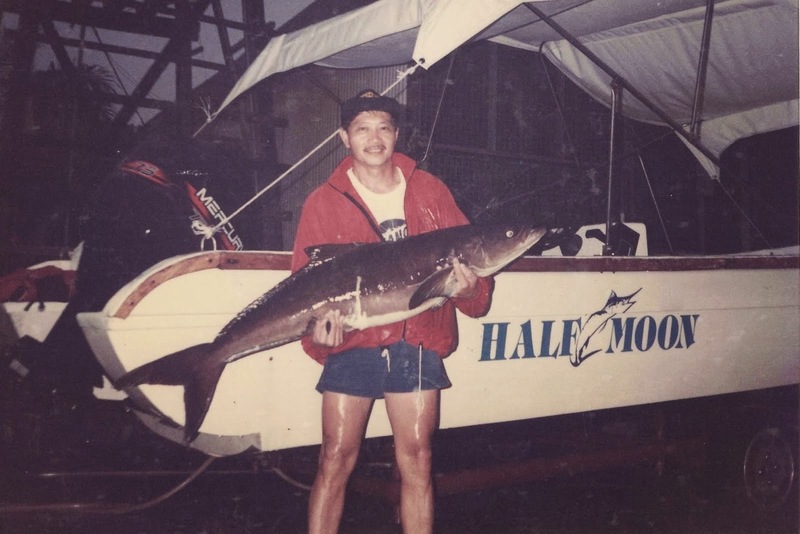 The captain was killed and the first officer died in hospital almost eight hours later. 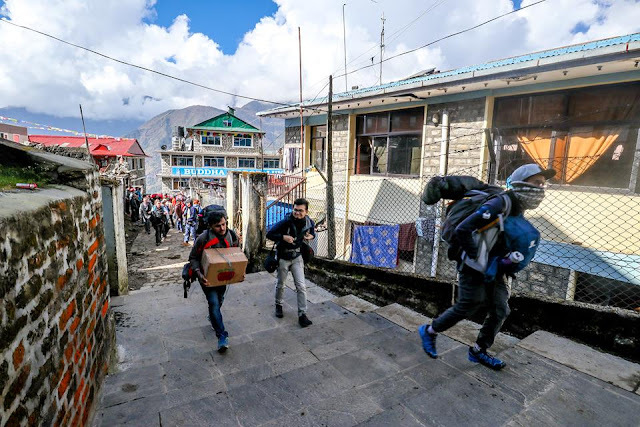 The third crew member received injuries and was evacuated to Kathmandu the following day after the weather had cleared. The runway is 527m × 30m with a 11.7% gradient. Due to the difficulties of successfully landing at the airport, the Civil Aviation Authority of Nepal sets high standards, for which only experienced pilots, who completed at least 100 short-takeoff-and-landing (STOL) missions, have over one year of STOL experience in Nepal and completed ten missions into Lukla with a certified instructor pilot, are allowed to land at the airport. 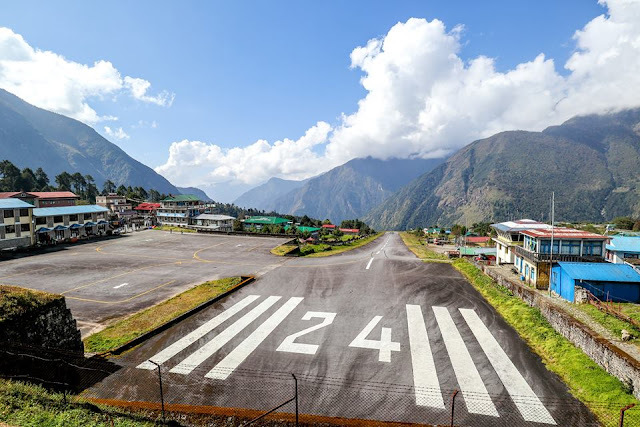 The view of plane taking off at Tenzing–Hillary Airport (2845m) is amazing. You can see the runway ending on hillside. 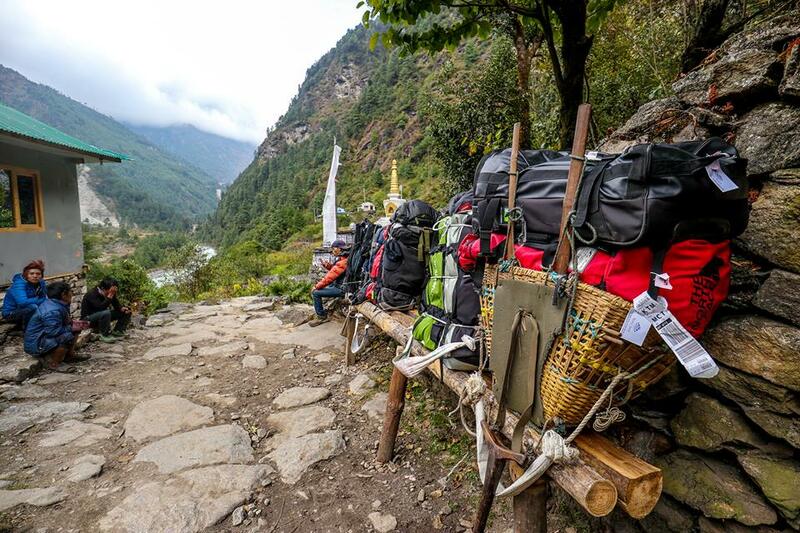 While we were having tea and briefing at The Nest Hotel here, the porters sorted the baggage among themselves. Tea time at The Nest Hotel, Lukla. Prakash our guide briefing us daily on what to expect and the route we are taking for the day. Lots of country flags and company banners hanging all over the place... not only in the Nest but almost all pit stops along the way. 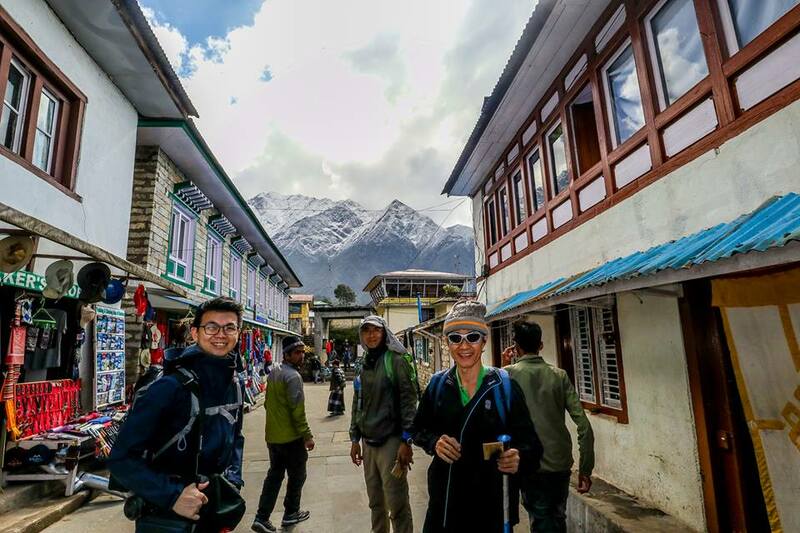 11.05am – Start of our trek towards Phakding. At the entrance, we had to pay Nr2,000 each which we felt it should be covered by the agent which was not mentioned in the agreement. 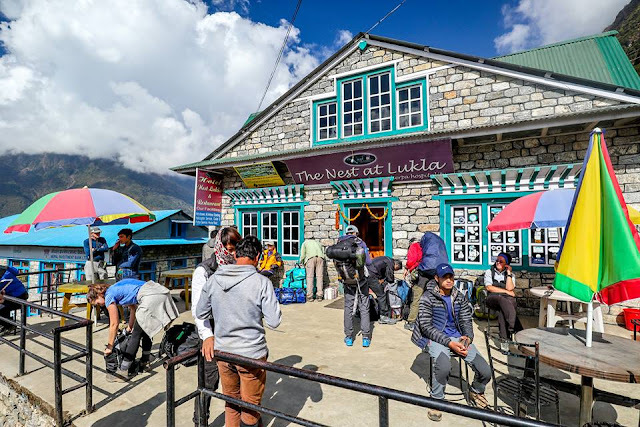 Lukla is a nice little town and it is the starting point for all those venturing out to EBC and the 3 passes etc. 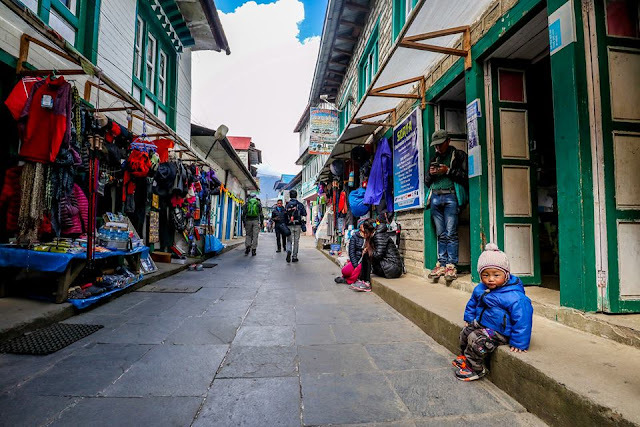 On the street of Lukla a Nepalese toddler just chilling. 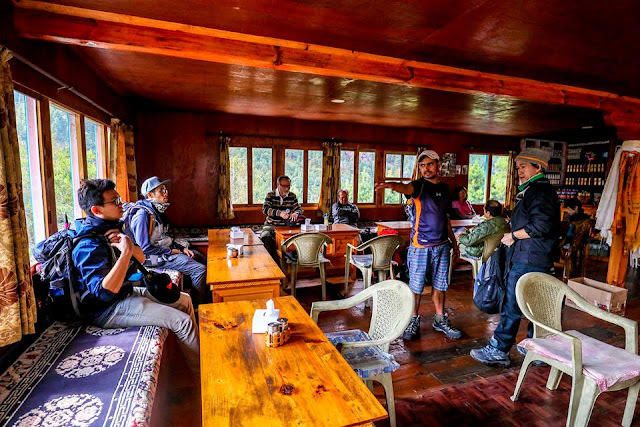 Everyone looking energetic and excited before the start of the trekking adventure. Mountains in the background... not uncommon along the trek to EBC. Randy and Prakash making monkey faces. How about Everest Burger for lunch? Noticed the dog in Lukla needs chilling and sunbathing. Look at this porter carrying a large load. 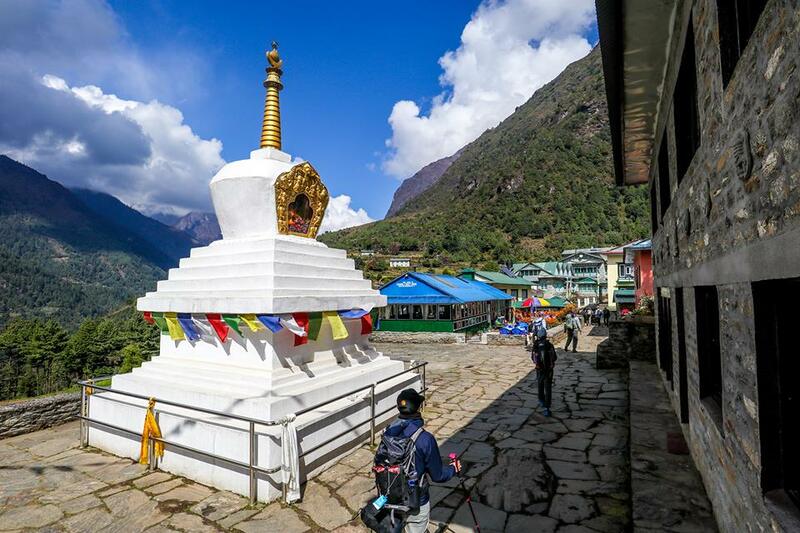 The archway marks the end of Lukla... and the start of the EBC trek! This is a memorial gate dedicated to Pasang Lhamu Sherpa, the first Nepalese woman to climb the summit of Mount Everest. 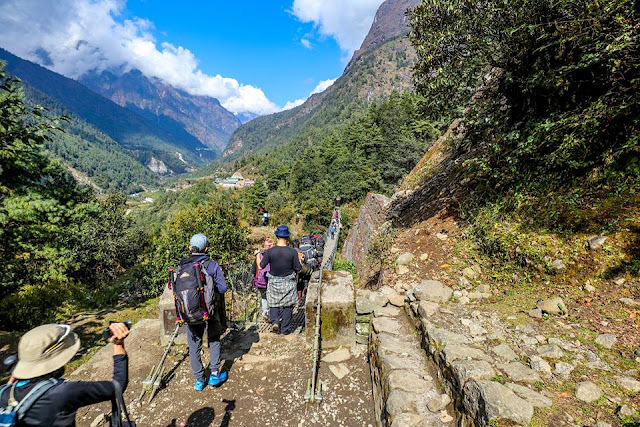 The trek begins as soon as you leave the small village of Lukla. Picturesque landscape everywhere. Chortens are large white-washed domed structures on a square base and with a steeple crown. They’re created in the memory of Buddha. Trekking through the village of Cheplung (2,700m) there were many guesthouses and cafes. The temperature is nice and cool at this altitude. At the village of Cheplung (2,700m). 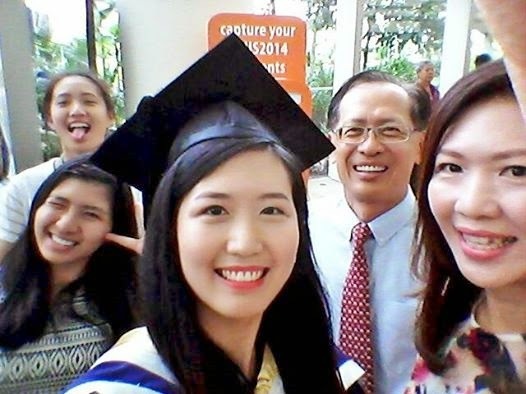 Ong Teik Hong showing the peace sign to all. Our guide Prakash Kapri with the two porters on his right; Prakash and Rajendra. Prakash is one of the porters that helped carry Randy's bag. This is Prakash our porter. All the porters are just young chaps (18 or 20+) earning some money from carrying bags. This is Rajendra our porter carrying Ching's backpack and a box of fruits. 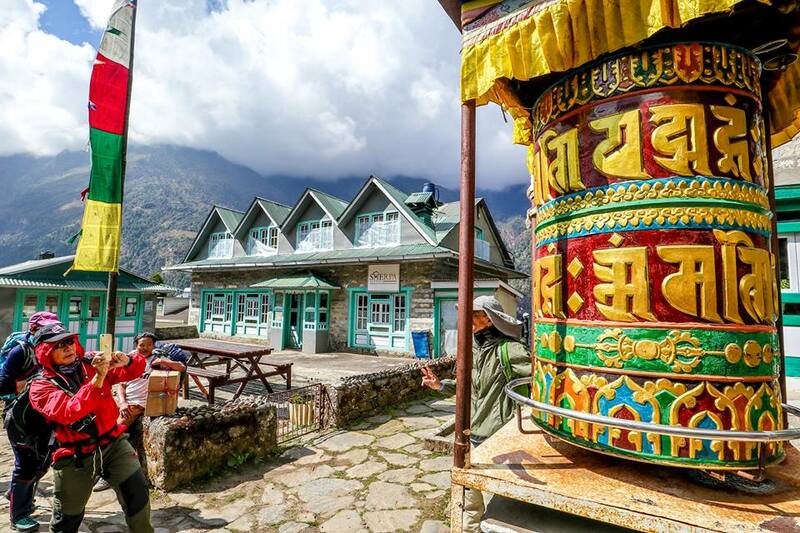 Prayer wheels... According to the lineage texts on prayer wheels, prayer wheels are used to accumulate wisdom and merit (good karma) and to purify negativity (bad karma). This is Prakash Kapri our guide. Spinning a prayer wheel clockwise, building a chorten, carving a mani stone, reciting prayers, displaying prayer flags—all of these gain greater merit toward a more fortunate rebirth. Donkeys were used as beast of burden to carry many commodities beside the porters. Horses/donkeys can be hired along the way when you are tired or are unable to move any longer... roughly around US$80 per day... can be more expensive at higher altitudes. Sanskrit inscribed stones piling up along the way. 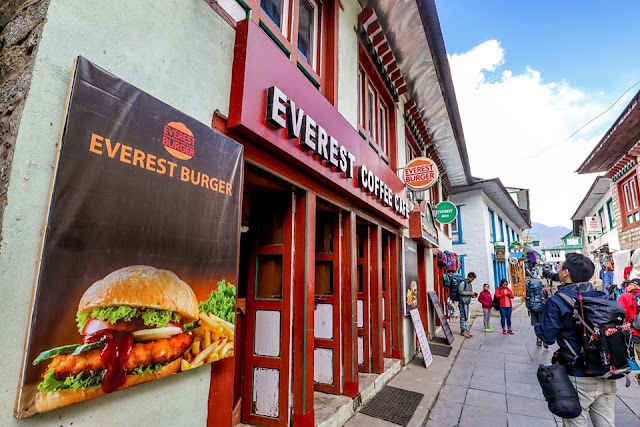 There are many guesthouses/cafes along the EBC route. Horses/donkeys eating their fill while they can. The first suspension bridge to cross before reaching Phakding. 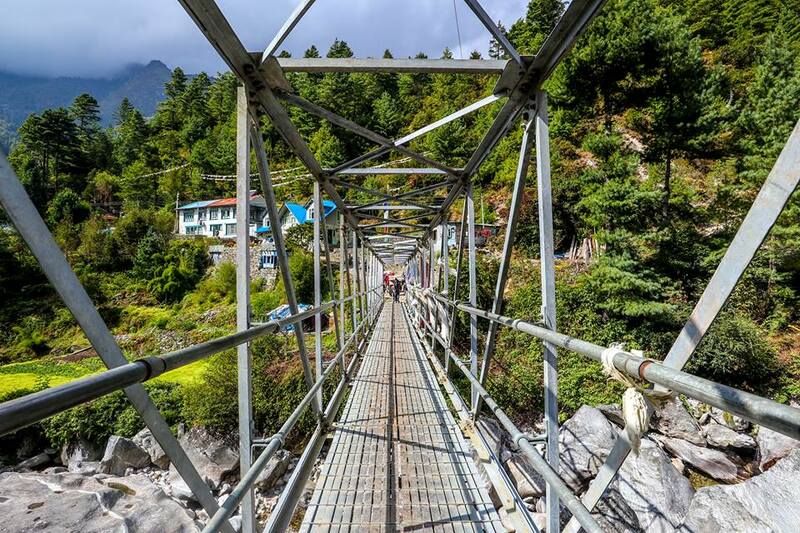 All these suspension bridges cross the Dudh Koshi River. Donkeys were also used as beast of burden to carry many commodities. 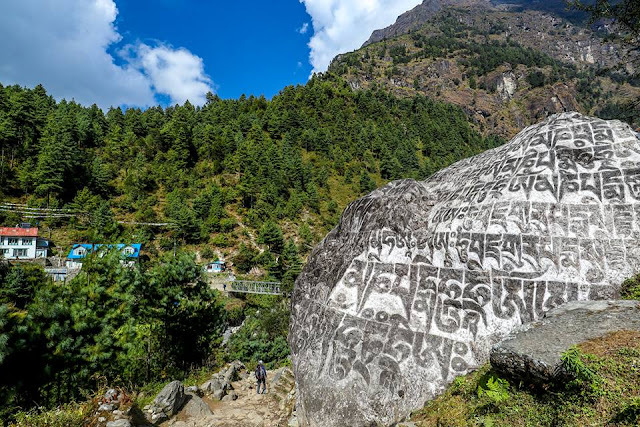 You’ll often encounter these mani walls of stones carved with the mantra Om Mani Padme Hum which loosely translates to Hail to the jewel in the lotus, but the meaning is much more complex. Sanskrit inscribed stones can be seen all along the way. Another bridge... this time a truss bridge. Crossing the truss bridge to the other side for lunch at the at Everest Summiter Lodge and Restaurant in Thado Koshi. The Dudh Koshi River. 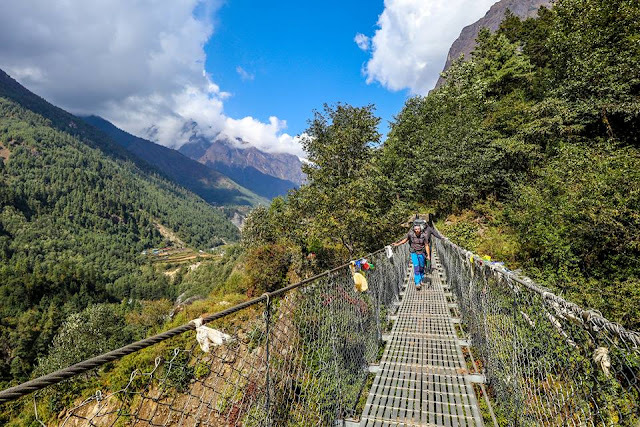 The trail follows the Dudh Koshi meaning milk river. 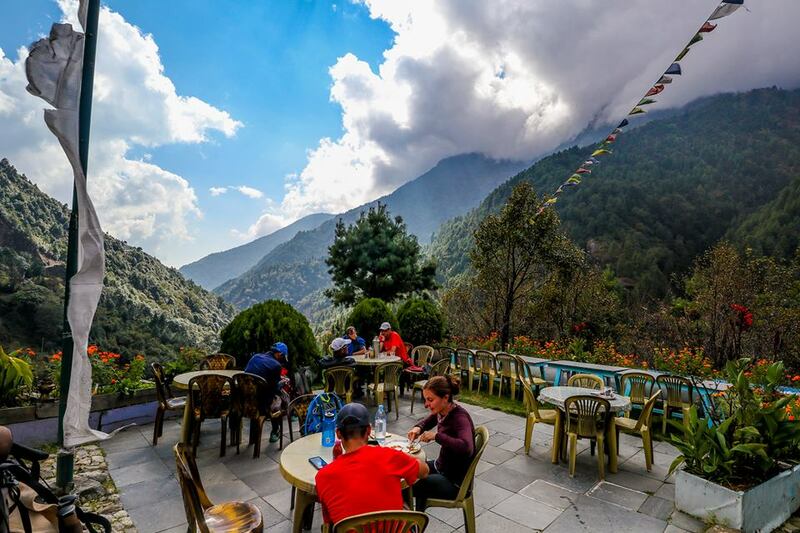 Picturesque landscape view at Sherpa's View Point Lodge in the village of Thado Koshi. 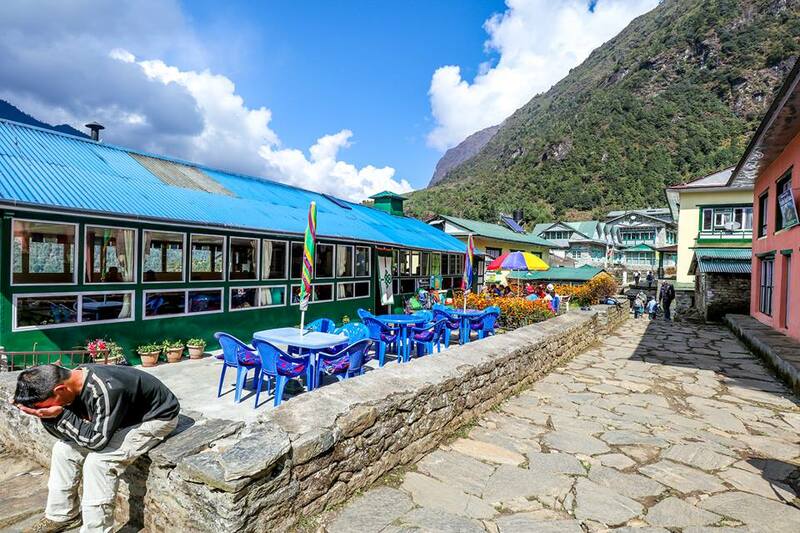 Picturesque landscape view at Everest Summiter Lodge and Restaurant in the village of Thado Koshi. In the village of Thado Koshi. 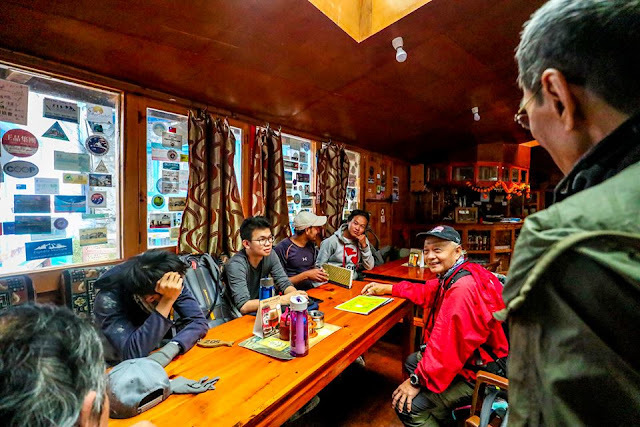 01.10pm – Arrived at Everest Summiter Lodge & Restaurant for lunch. Our standard Dal Bhat and our own preference of drinks. Their fried rice and fried noodles are good for 2 person...! 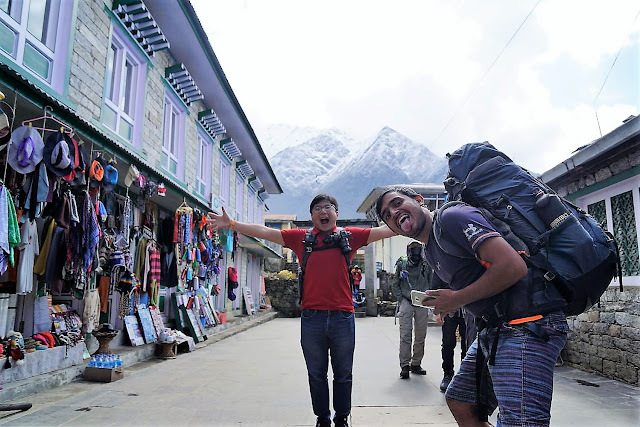 At the start of the trek... our appetite is still huge and we were very hungry after trekking for 6 hours a day... 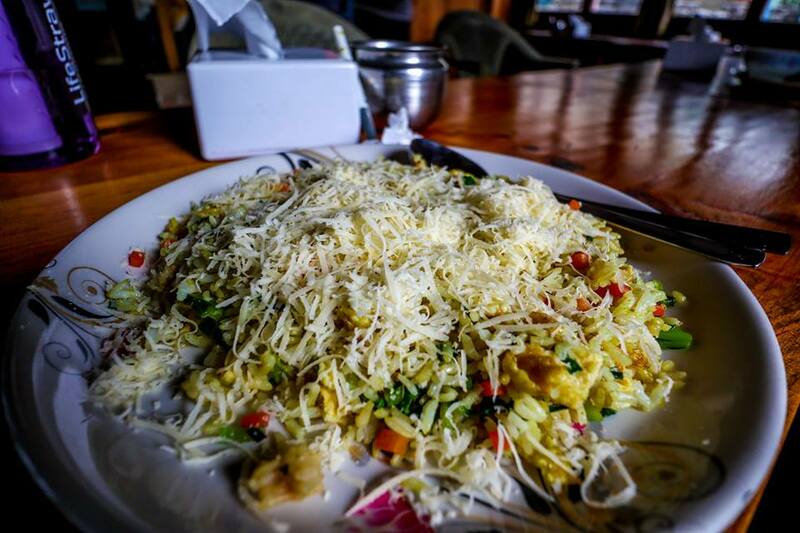 This portion of fried rice with cheese is nothing. 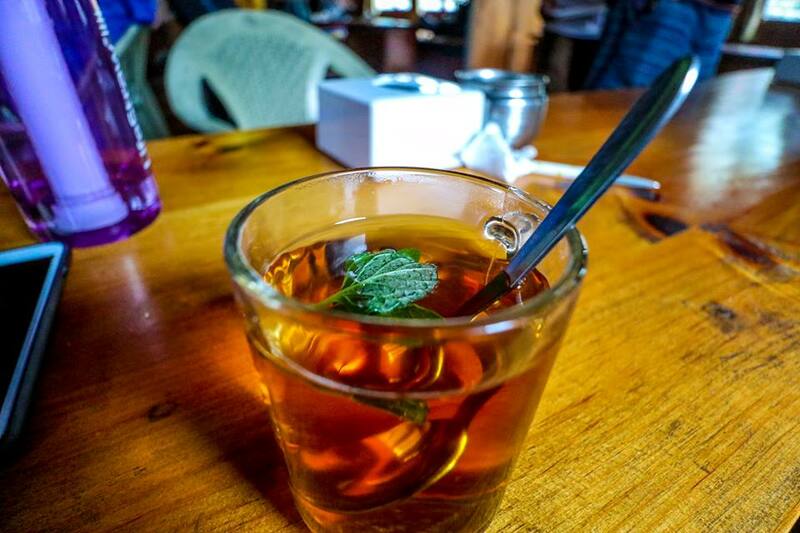 A hot mint tea after a heavy meal is always good for digestion. 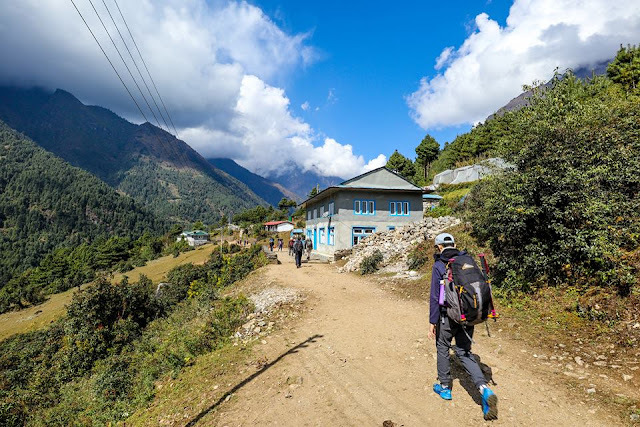 02.23pm – Continued our trekking towards Phakding. 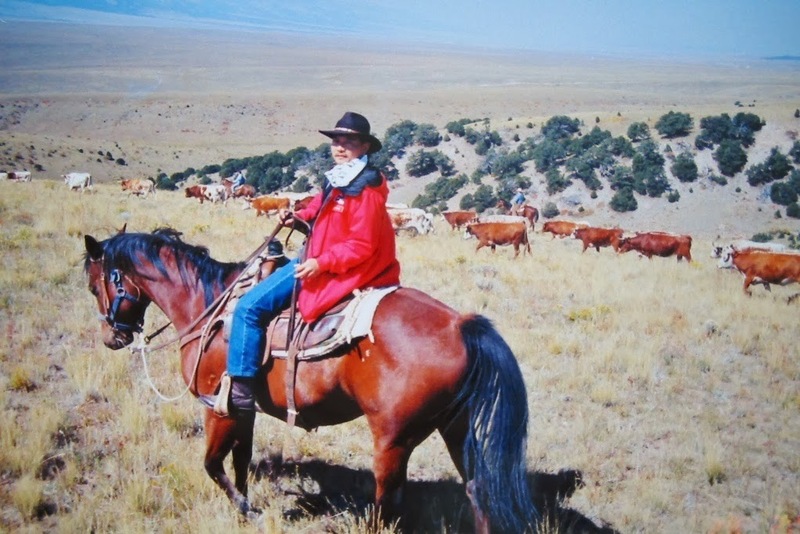 A western cowboy playing his guitar on the EBC trek. 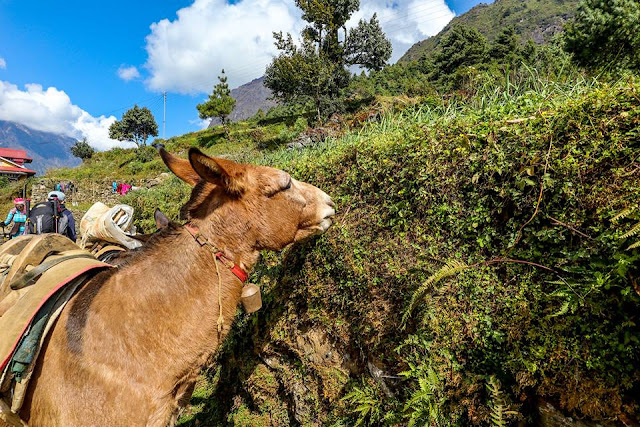 Yaks were used as beast of burden to carry many commodities on the EBC trek. Trekking through the village of Ghat (2,590m) with its picturesque landscape. Picturesque landscape through the village of Ghat (2,590m). A typical Tibetan house on the EBC trek. Yaks are common at higher altitude of above 3,000m. The guesthouse usually harvest their own veges (eg. 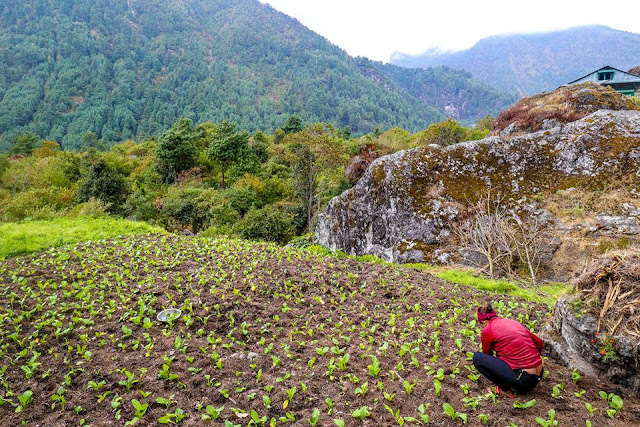 cabbage etc)... meat is usually carried from Kathmandu/Lukla to higher regions. 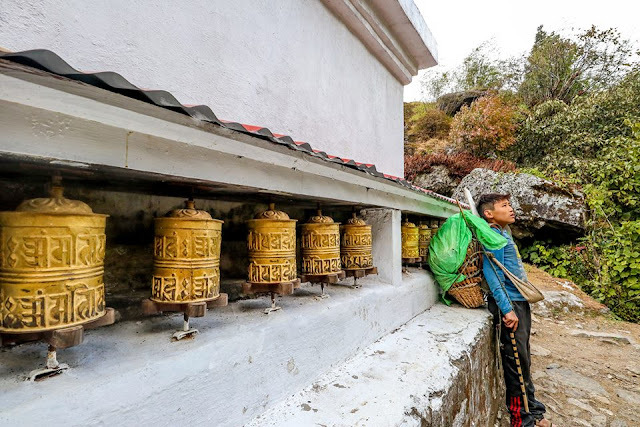 Boy taking a rest by the prayer wheels after carrying heavy load for some time. 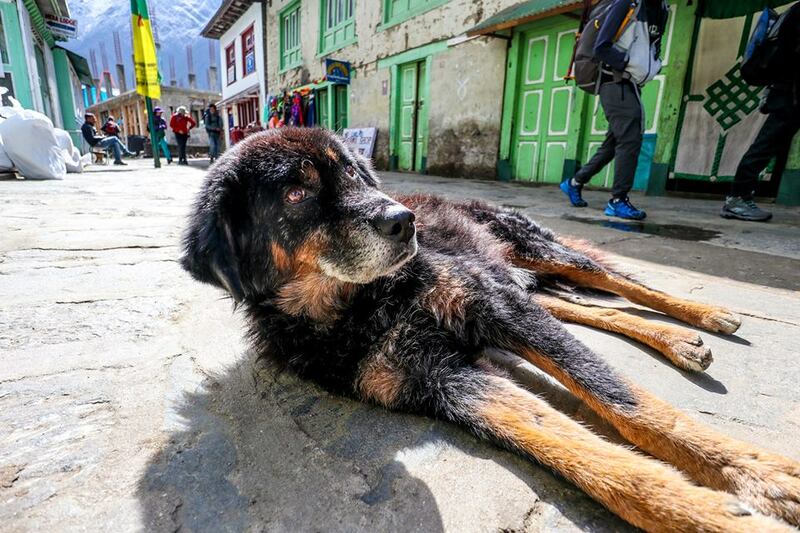 Rest point for all the porters/goods transporters. The T-shape stick is useful as both a walking stick and a single-legged stool to rest on. Boulder-sized Mani stones are often painted in bright colors. The Sherpa create these works of art to show devotion to their gods and Buddha’s teachings. When local people come upon them, they circumambulate clockwise as a prayer for health, peace, and protection. They are the most important sources for the history of Nepal. A vast majority of the inscriptions found in Nepal are from the Kathmandu Valley where they are an ubiquitous element at heritage sites. They consist of royal edicts and dedicatory notes on Hindu and Buddhist temples, stupas, statues and other architectural structures. 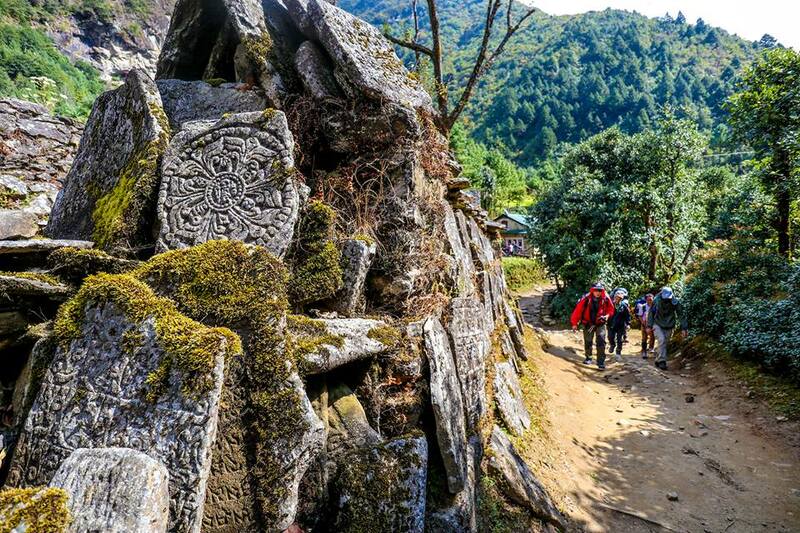 The rocks are carved with the Buddhist chant “om mani padme hum” as an offering to the spirits. 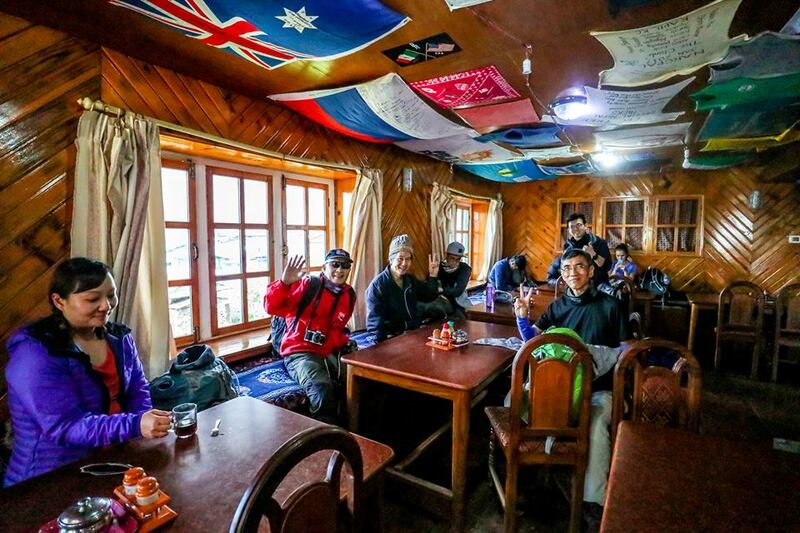 A new Sherpa Guide Lodge. 03.28pm – Arrived at Phakding Hotel Beer Garden for the night. It was raining the whole afternoon. We had our dinner at 5.55pm. Briefing was held at 6.30pm. We slept at 7.30pm. Temperature was 8 degrees Celsius. Phakding is a small charming place with some comfortable lodges. After 3hours of trekking from Lukla... finally arrived at our guesthouse in Phakding for the night at Hotel Beer Garden. 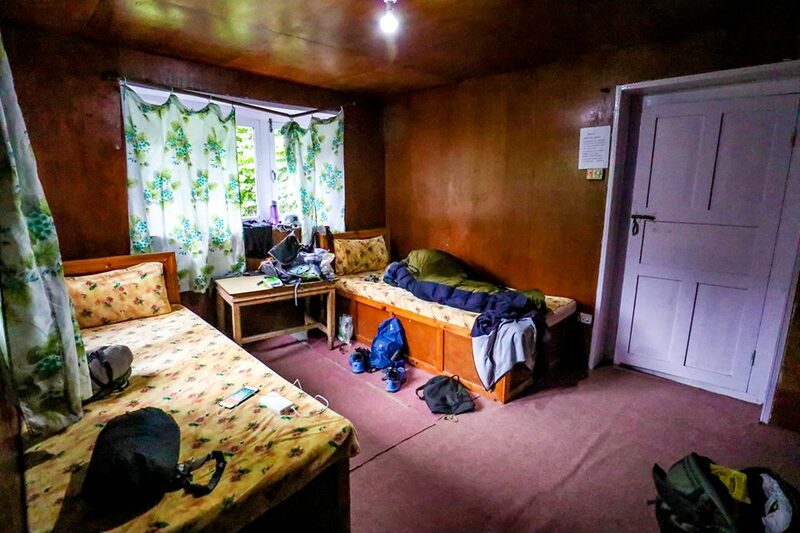 Most of the rooms in the guesthouse is a 2-bed room. Hot showers requires payment (~US$4) and it goes up as you go higher in altitude. 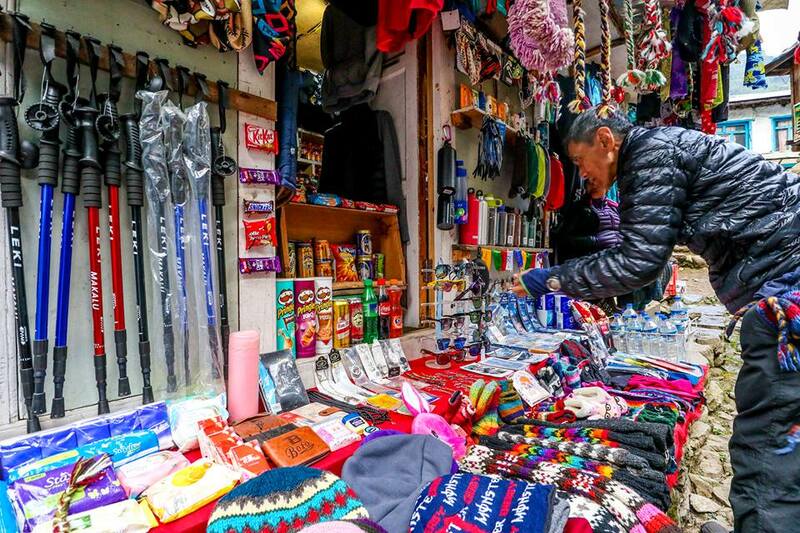 There are a few shops in Pakding selling essential items for the trek. 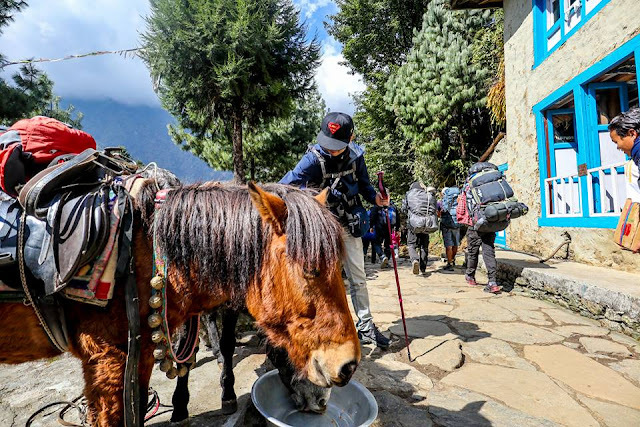 The trek from Lukla to Pakding is actually not difficult as it is generally a descend from 2800m to 2600m. Everyone is still energetic and happy. 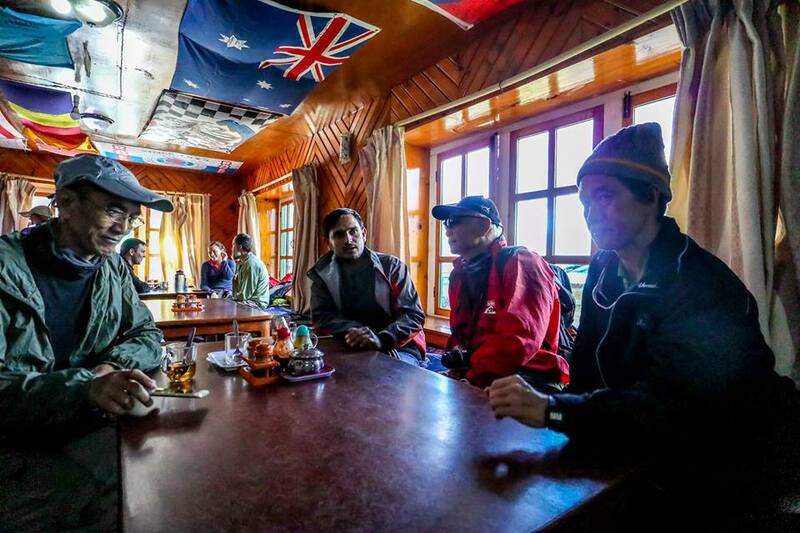 The common room at the Beer Garden Lodge in Phakding. Ong Teik Hong had Mushroom pizza for dinner. 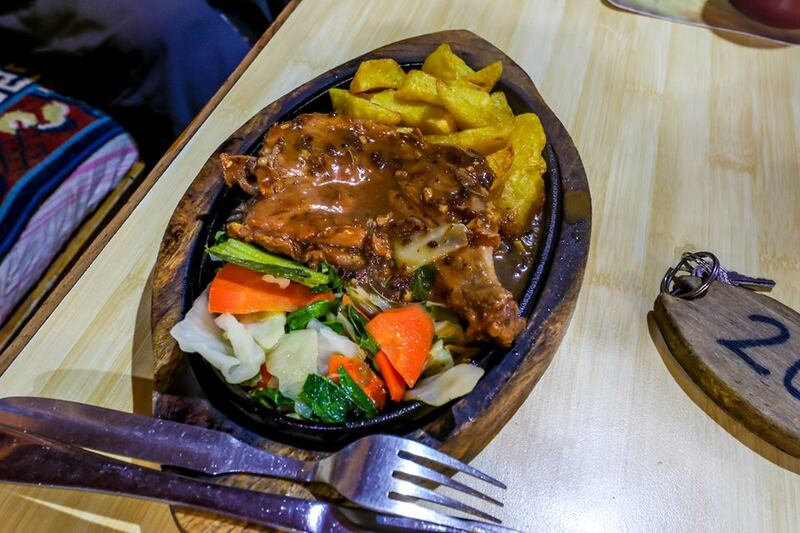 Randy Ngatimin had Chicken sizzler for dinner. 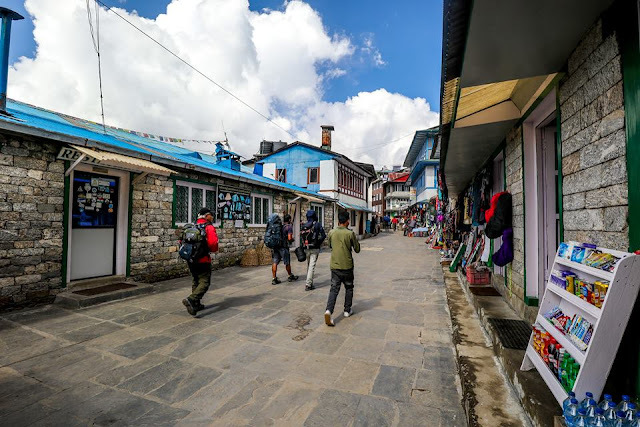 The 15day ground trip in Nepal is ​USD1,050 per-person excluding the flight to Kathmandu from KL. Cost Inclusive: Exclusive medical kit bag, All government and local taxes, All domestic airfares as per the itinerary, Everest base camp trek permit & tims card, Down jacket and four seasonal sleeping bag, Airport arrival and departure by private vehicle, 2 star accommodation in Kathmandu with breakfast, 1 English speaking guide and (porter) and their payments, Sagarmatha National park entry fee and necessary permits, Comfortable accommodation on tea-house/lodge during the trek, Full board meal (breakfast, lunch, dinner, tea & coffee) in during the trek. Cost Exclusive: Personal trekking Equipment, Lunch and dinner in Kathmandu, Travel and rescue insurance, battery re-charged, Tips for driver, guides and porters, hot shower, pot of tea or coffee. Personal expenses e.g. phone calls, laundry, bar bills & extra porters. Himalayantrekking offers best Upper Mustang Trek at effective cost. 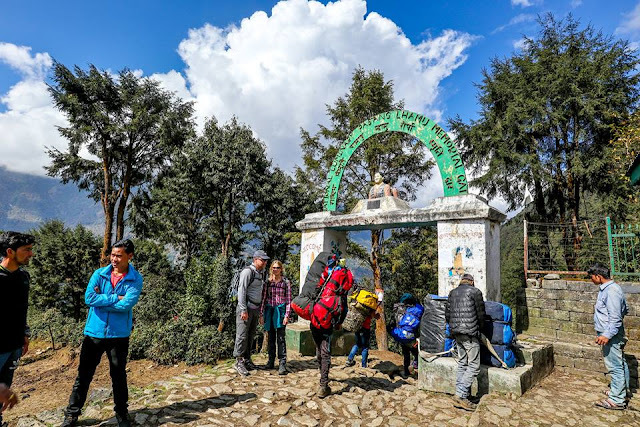 If you want to feel the ambience of Nepal then you must go for Nepal Mustang trekking that makes you feel rejuvenate once again.